Don’t let the naysayers talk you out of your trip to home restaurant Mzansi. It is midday in the Langa township and the music from home restaurant Mzansi has attracted a group of curious schoolchildren. They peer through the gaps of the gate, eager hands clinging to bars shrouded in green netting that keeps out the afternoon heat. Inside, Mzansi is a hive of activity, a bustle of motion in the stasis of a Langa afternoon. A five-piece band plink-plunks away on three marimbas, a pair of drums, and a saxophone, playing a mix of traditional tunes and classics such as Guantanamera and The Lion Sleeps Tonight. 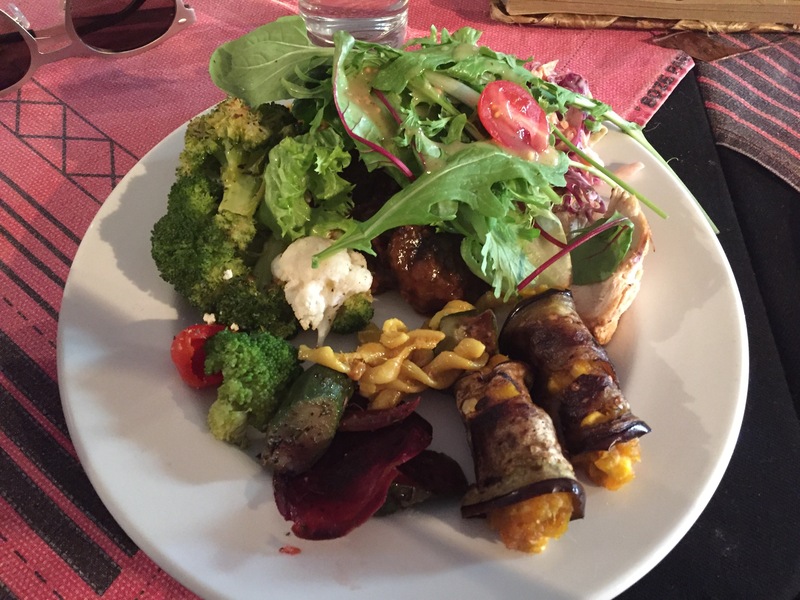 We dine on a sumptuous buffet spread – beef stew, roast chicken and vegetables, aubergine and pumpkin rolls, dips and salad – all of it hearty and comforting, cooked by owner and chef Nomonde Siyaka. After the meal, Nomonde and her husband Ace, who is the other half of Mzansi, corrals the group from their seats, and gets everyone to dance – a simple clap-stepping, elbow tapping jig that we imitate Ace as he performs. The band rounds up some of us, teaching them to play the marimba and the drums. Surprisingly the resulting music is not half bad, any mistakes drowned out in the chorus of clapping and singing and laughter. Nomonde takes four to five hours to prepare a meal like ours at Mzansi, which means south. She only cooks when there are bookings, and then only for the number of people turning up. In Langa, where according to a 2014 World Bank study about 60 percent of the population is unemployed, there is no walk-in crowd. People can’t afford it. Today there are about 12 of us – a group from France, an English couple and their guide, and Dean and I. Today none of us were scared off by people cautioning us against coming to Langa. 52-year-old Nomonde is used to cooking for a group, and having less than half of them show up. Sometimes, she says, people email to make reservations weeks before their trip. But then they come to Cape Town, where taxi drivers and hotel concierges discourage them from coming to Langa. Sometimes they listen. 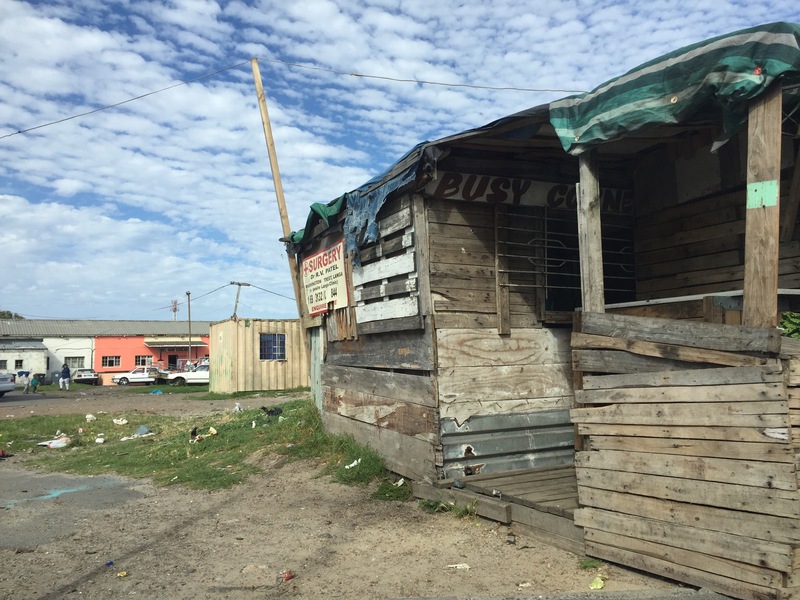 “You go to Langa, you might not come back,”caution these naysayers, according to Nomonde. All of us, seated at the table, we laugh. We laugh at their fears, their apprehension, their foolishness keeping them from the glorious lunch we are having. Nomonde laughs too, but she suffers every time it happens. There will always be hungry mouths to finish the excess food, but no one to make up for the loss of income. These are sentiments that tour guide and Cape Town resident Sally Christini is familiar with. The retired schoolteacher makes it a point to introduce Capetonians to Mzansi whenever she can. Sally organized her sister’s birthday party and her son’s wedding there, and gets bookings for the resident band, which earns money solely through tips at Mzansi, to play at weddings and events. Owner Ace Siyaka leads guests to dance along to the resident band’s tunes. But Sally has many people to convince. Nomonde estimates that the bulk of her clientele – about 99 percent – are international visitors, and that locals prefer to stay away from the townships. “The scars of apartheid are still there,” she says. During the apartheid years of 1948-1994, the white government drew racial lines that determined where people could work, study and live. People who were black and coloured (of mixed race) were evicted from the cities and forced to resettle in townships, or informal settlements. Those around Cape Town were 25-40 kilometres from the city – far enough so they would be out of sight from the privileged white minority, but close enough for them to commute to work every day. Invisible cogs that kept the machine going. Langa is the oldest township in the Western Cape, but it is similar to many of the others spread across South Africa. Although living conditions have improved after apartheid, black people are now allowed to own land and families of up to ten people no longer need to share a one-bedroom house, home in the townships is still a far cry from brick-and-mortar gated homes, sometimes just a couple of streets away. In the poorest parts of the township, houses are still ramshackle, cobbled together out of wood and zinc, or a sawed apart shipping container with the edges long rusted away. There is still violence, such as the protests last year where mobsters looted shops, beat up commuters, and set fires in the dusty streets. There are youth still idle; there are families still poor. Nomonde is trying to change that. She hires members of the local community to help in the kitchen, serve food and work as parking attendants outside the two-storey building. “Everybody’s got something, even if only for one day,” she says. Most of her produce is sourced in and around Langa – vegetables from the women who grow them in small plots near their homes, dry produce such as rice and potatoes from the shops started by immigrants. Although South Africa’s townships are poor, they are a choice destination for citizens of surrounding nations – Somalia, Mozambique, Lesotho, all threatened by civil war and instability. “While they are here, we must uplift them,” says Nomonde, cutting a matronly figure in a green polka dotted apron and a colourful scarf tied around her hair. She wasn’t always the provider, the employer, the helping hand for the community. 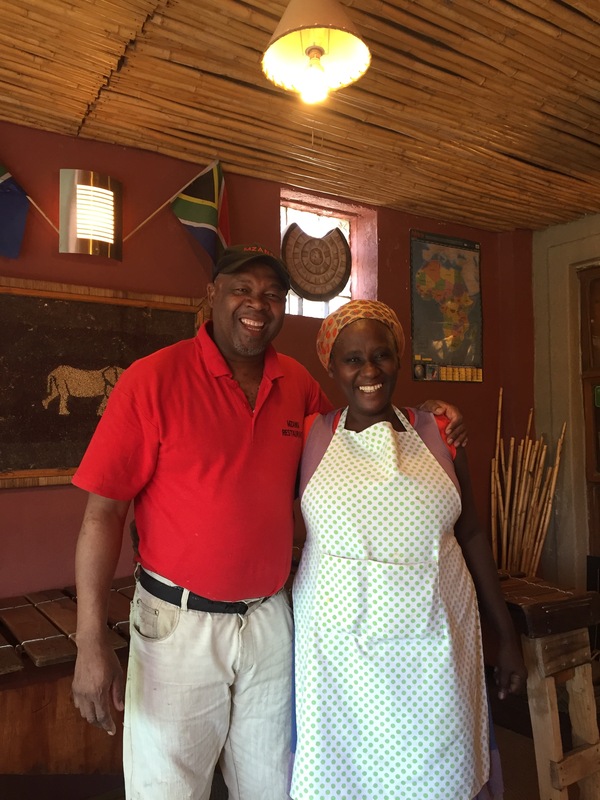 Nomonde and Ace Siyaka, who own home restaurant Mzansi, started the business eight years ago but have only recently seen crowds throng the restaurant. For the better part of eight years that Mzansi has been open, Nomonde and Ace struggled too. They first started the business with the retrenchment package Ace got from his previous job. Mzansi would buy decorations, furniture and cutlery from a thrift store, and Ace would repair what was broken. In those early days, business was slow, and bookings were hard to come by. Sometimes, they would go up to three months before any guests would come. Their fortunes changed last year when a group of American students visited Mzansi in June, and offered to market it on Tripadvisor. Initially, the mother of two was skeptical. “I thought Tripadvisor was for restaurants in town with beautiful sea views,” says Nomonde, referring to the fancy places along Cape Town’s V&A Waterfront, an up market area lined with souvenir shops and seafood restaurants, where yachts and catamarans take turns to offer tourists a leisurely sail. But she let the students have a go, and watched as Mzansi climbed to number 30, then 10, then into the single digits. It is second when we visit, and at the point of writing, holds top spot among the 962 restaurants listed in Cape Town Central. A search for the restaurant lists six pages of glowing reviews, the first one submitted in 2014, the rest following quickly from June this year. Nomonde takes bookings for lunch and dinner almost every day now. It is hard work, but work is a happy problem. She relishes the guests that dine in her living room, the friends she makes from all over the world. “Where have the people been all these years?” she laughs, as she does often while sharing her story. Mzansi Restaurant is located at 45 Harlem Avenue Langa, Cape Town 7455 South Africa. Nomonde takes bookings at +27 (0) 737548502/+27 (0) 216941656 or nomonde@mzansi45.co.za. 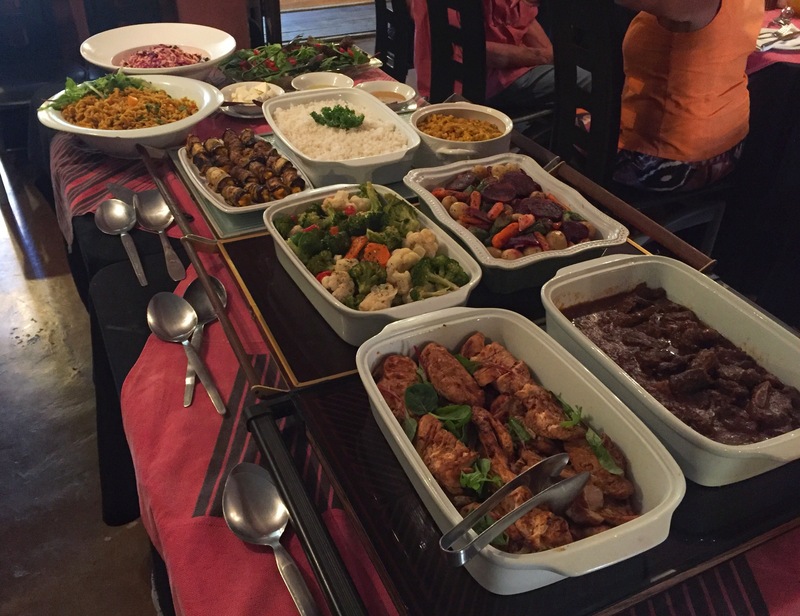 Buffet lunches and dinners at 180 Rand (18 SGD). Clara! Okay, this is on my bucket list for sure!! (Also, I loved that you weave in bits of history.) Do you think that if you were alone, you still would have gone? Additionally, would you have other travel blogs (that are similar to yours) to recommend? Hi Jenn, sorry I took a while with this! Thanks for commenting, you’re my first reader to write something! 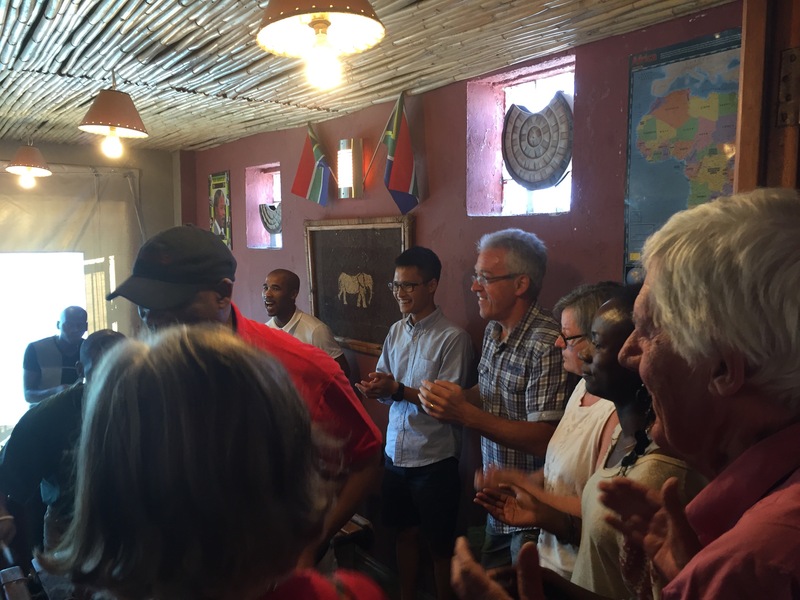 I might have been a bit apprehensive, but my recommendation for solo travelers would be to join a township tour – many operators take guests on walking tours of Langa, and if you request it they can finish off with a meal at Mzansi’s or drop you off there. The two other groups from France and England who had lunch with us were both on tours. It’s super informative to visit a township with a guide who can explain the context and background of what you’re seeing, I did one in Johannesburg and really enjoyed it. For travel blogs, I usually google blogs on the places I plan to visit but I’ve never really found any similar to mine that I read regularly. But for good travel writing, I’m really inspired by Paul Theroux’s non-fiction. I’m currently reading Last Train to Zona Verde, which chronicles his overland travels from Cape Town to Namibia and Angola. His prose flows so beautifully and is candor is on point. Wish I could write like that! !